In the middle of an emotional break up, this is absolutely the most important thing that can be discussed. Go get ’em, tiger! 1. No. Especially if the book is that good! 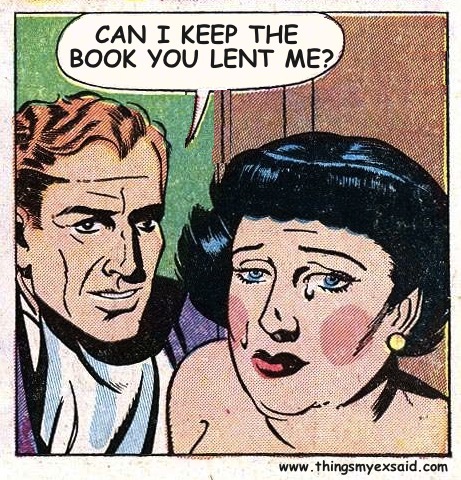 Now she wants nothing more than to rip that book out of your clammy, callused fingers. 2. Yes. Because SHE CAN LORD OVER YOU the fact that at a time such as this, she won the emotional high ground, while you put your chips behind the fleeting, tawdry thrill of a book. Dude, I don’t know the specifics here, but unless she cheated on you it kind of sounds like she won the break up. But you enjoy that book of hers! Just try. Thank you! However, I have to confess this quote was an anonymous submission, so I’m not sure who to pass your empathy onto. And in the spirit of confessing, I should admit that I’ve come pretty close to saying something like this during a break up, myself. Except they were my books and I wanted them back. But, ya know, I like books.